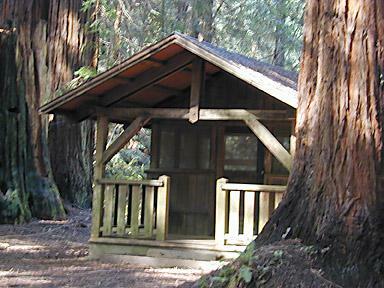 The Mendocino Woodlands State Park is comprised of three private “group campgrounds” in a serene setting creating a unique environment for retreats, seminars and nature studies. Each camp is a separate, self-contained area with its own cabins, kitchen/dining/recreation hall, shower/toilet facilities, and campfire circle. 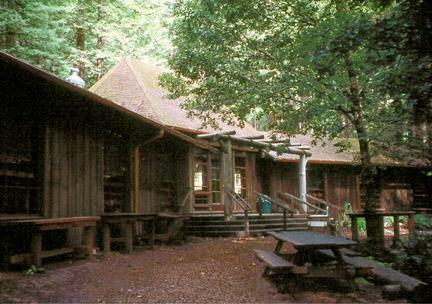 Camp One has a total of 46 “four-bed cabins,” each fully enclosed and equipped with a fireplace, closet and balcony. The cabins are clustered in three groups, each group with a hot water shower/toilet facility. The kitchen joins two dining halls with a large fireplace in each hall. There are also two large cabins with electricity, bathrooms, and running water that will accommodate another eight people each. In addition to its main dining/recreation hall, Camp One has an 1,800 sq. ft. recreation hall with a large stone fireplace. Camp One has minimum occupancy of 120 individuals required for Summer (June–August) months. Minimum occupancy of 60 people is required for Spring (April–May) or Fall (September–November) months. Camp One has a maximum capacity of 200 people during a single camping session. Camp Two has a total of 24 “four-bed cabins” and 8 “two-bed cabins.” Each of these cabins are wood structures with screened windows and a closet. Camp Two has the “Gate House”, which has five (5) beds, electricity, glass windows and a fireplace and the “Hill House”, which has six (6) beds, electricity, water and a full bathroom. This camp also has 2 “four-bed” tent cabins. A Kitchen adjoins the Camp Two Dining Hall, which has a large fireplace at each end with a hot water shower/bathroom building nearby. Camp Two has a minimum occupancy of 80 persons for Summer (June–August). Minimum persons of 40 people is required for the Fall (September–October). Maximum capacity: 130 View Information. Camp Three is ideal for smaller groups, Camp Three has 16 “four-bed tent cabins,” each with a wooden floor and canvas tent over a wooden frame. The Camp Three Kitchen adjoins a dining hall with a large fireplace. There is a central shower/restroom. The tent cabins are clustered in two groups with a cold water toilet facility in each group. Camp Three has a minimum occupancy of 30 persons for Summer (June–August). Minimum persons of 30 is required for Spring (May) or Fall (September). Maximum capacity: 64 View Information.